Chief Minister (CM) HD Kumarawamy is expected to visit New Delhi in the coming week to discuss the cabinet expansion and appointments to boards and corporations with the Congress leadership. It may be recalled that the cabinet expansion had been initially deferred owing to the ‘inauspicious’ month of Ashada. Later it was postponed following the announcement of the bypolls. In a recent meeting, former prime minister H D Deve Gowda has given his green signal for the Cabinet expansion. 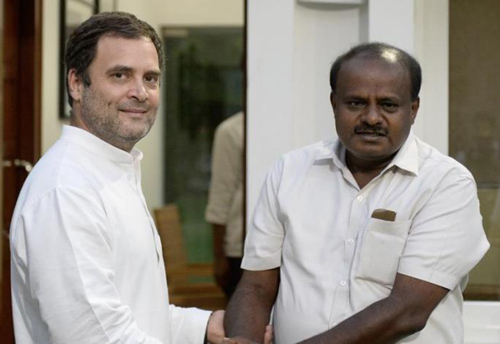 If sources are to be believed Kumaraswamy will hold talks with state Congress leaders before proceeding to hold discussions with Congress chief Rahul Gandhi in the national capital. Senior Congress leaders, including former chief minister Siddaramaiah, deputy chief minister G Parameshwara, Karnataka Pradesh Congress Committee President Dinesh Gundu Rao and Water Resources Minister D K Shivakumar are also likely to visit Delhi.